virtual transmission from Belgrad to Laznia CCA. The opening of Mobile Studios project. Stream transmittion to Belgrad of documentation of a city derive and lecture of Wilfried Hou Je Bek. ‘COMOKO' gellaturo & Marcin Sokolowski. Series of applications in the form of games, active presentations and animation for mobile phones accessible on line and at Laznia. Opening of the artwork in public. Video documentation and the live transmittion during the opening day to Budapest. Ania Witkowska, Adam Witkowski. Matryca, presentation in the public space and at Laznia. Patrycja Orzechowska, Happy are those who go to work, video documentation of the process and the opening of a massive mural on a wooden fence located in public. 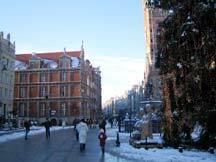 The video documentation of events taking place during the night at Gdansk museums and culture centers'. Accessible by net since 21 May at Sofia. THE DIALOGIC SPACES: Space of privacy, publicity and of anonymity" a discussion live transmitting to Sofia. The video documentation of events taking place during the night at Gdansk museums and culture centers'. The finisage of two exhibitions at Laznia CCA, transmittion from the finissage of Mobile Studios at Sofia.